Oil on canvas: 58 1/2 x 50 1/2 in. 148 x 118 cm. Provenance: Provenance: Probably sold from the artist’s studio through Boussod Valadon to a member of the Drexel family, Dr. and Mrs.Charles Penrose. 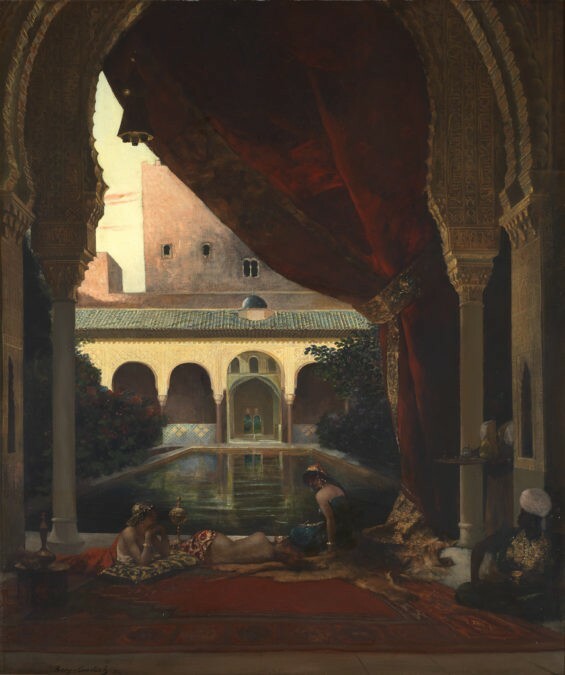 Our painting shows the courtyard of a Moorish Palace with languid figures resting beside a pool, watched over by a seated attendant. The setting evokes the interior spaces of the Alhambra in Granada, which Constant must surely have visited, while the scene is framed by exquisitely rendered and decorated arches fronting a deep red curtain. The picture exhibits the artist’s familiar palette of saturated reds and ochres, offset by emerald greens and the deepening black shadows which demonstrates his debt to Rembrandt. Rich textures and monumental compositions are central to Constant’s mature paintings of the 1870’s and 1880’s. This is one of the artist’s largest works which has been hidden in a private collection in London for over fifty years. Benjamin Constant has only recently retrieved his position as one of the great Orientalist painters of the nineteenth century, continuing a tradition initiated by Delacroix and Gericault. A recent exhibition at the Musee des Augustins, Toulouse in 2015, where he studied, succeeded in re-establishing Constant as a masterly painter of the exotic Orient, commanding a sumptuous palette of colour, and a powerful sense of atmosphere which evokes the saturating heat and light of his north African and Middle Eastern settings. Above all his sure grasp of composition creates scenes of impressive theatricality inhabited by languorous figures and thrusting warriors. After studying at the Ecole des Beaux-Arts, Toulouse, between 1859-1866, Constant gained a scholarship to continue his training in Paris until 1871, when he embarked on a prolonged tour of Moorish Spain and Morocco. Here he executed the many sketches and studies that would provide inspiration for the large compositions painted during his maturity. In this he could hardly avoid the pervading influence of Delacroix whose travels to north Africa had so signally aroused fascination with the world of the Orient in the 1830’s. But Constant was at the cutting-edge of a revolution in the art world, which changed dramatically with the establishment of the Third Republic in France (1870-1940). Government commissions for churches and institutions slowed down to be replaced by sales through private dealers and galleries. Hence Constant had to look outwards to find new clients to support is artistic output. He visited Canada and the United States, where he found a ready market for portraiture but mainly for his rich evocations of an exotic, eastern world hardly known to the general public. His reputation as a portraitist was sealed by his celebrated images of Queen Victoria (1899), Pope Leo XIII and Princess, later Queen Alexandra (1901). As might be inferred from these sitters, Constant was very much a conservative, bourgeois figure, guarding the traditional, salon traditions of French nineteenth century painting, albeit with an exotic dimension that reflected his country’s colonial expansion. His art provides a fascinating counterpoint to the plein-air Impressionists who were working at the height of his own success, but it must be noted that Constant’s rendering of light and atmospheric valeurs in his chosen field was equal to theirs. Constant’s burgeoning reputation is reflected in the presence of his works in the major museums of the world, including the Louvre, the Metropolitan Museum, New York, the Hermitage and the National Gallery of Canada. Other works by him have lately emerged from private collections in Egypt, Algiers and Morocco. I am writing to enquire about "A Courtyard in the Alhambra"